Before I start, I really should warn you: this article could start an addiction. The Nurburgring is an enthralling, exciting, dangerous, scary and manic place. Fourteen miles of challenging tarmac in the heart of the German countryside that combines the best features of the world’s race tracks into one enormously long, automotive-based rollercoaster ride. The diversity of machinery and drivers never ceases to amuse me. On one lap, you could be driving flat out passing a family saloon (sight seeing I might add – they probably saw a great review on Tripadvisor), whilst on the next a BMW test driver will waft past effortlessly in the latest M5 ‘ring taxi. My most memorable experience was passing a coach full of octogenarians before being ripped a new one by a pursuing Ariel Atom. The Nurburgring is somewhere that feeds the inner speed demon, with speeds in excess of 150mph at the Flugplatz (flying place) quite possible, yet there are also technical sections like the wonderfully cambered Karrusell (carousel) and the deadly Foxhole. The Foxhole is one of the most recognisable corners as it features heavily in many Nürburgring YouTube videos. The ones where the car enters at speed and gets spat out like a pinball between the armco barriers. There are over 70 corners with all sorts of permutations of camber, size, entry speed and direction change. It might be a Nurburgring cliche, but the track will not forgive those who do not treat it with reverence. A lapse in concentration can result in even the most proficient ‘ring Meister turn rewarded with a trip to the regularly refreshed barriers. This circuit is as about as famous as it gets too. Formula One hero Niki Lauda had his near fatal crash here in the 1976 German Grand Prix. 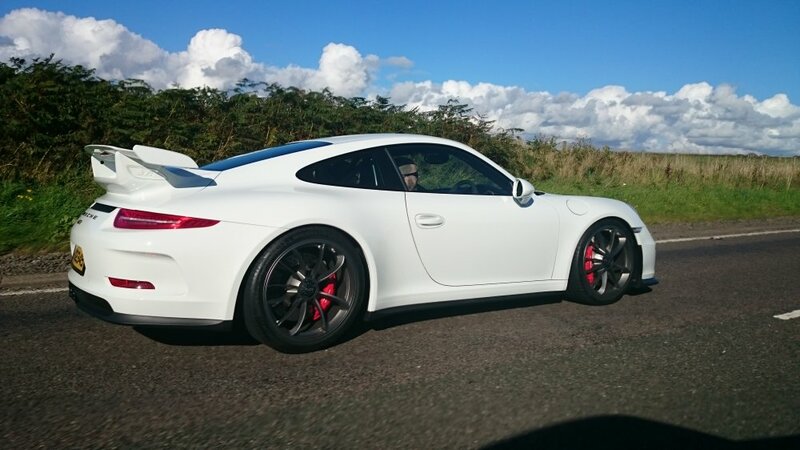 ‘Ring lap times are the pub ammo of choice for the discerning car enthusiast. Most performance car manufacturers attempt to out-do each other chasing the ultimate lap time for their marketing department’s consumption. Top Gear’s regular features have meant that an 8 minute lap has become the unofficial benchmark. Sabine Schmitz in a van against the clock became required viewing across the world! This unique combination of geography, mental challenge and complexity, coupled with the fact this is at it’s most simplest, a one way toll road, conveys why the ‘ring is the go to place for driving aficionados If you like the sound of the place so far and are thinking about a jaunt, I’ll tell you how to get there from our small patch in Northern Ireland. It’s actually very straight forward. The three things that you need to get in check are: trip prep, car prep, and driver prep. Unlike a track day or MSA motorsport event that may require a roll cage or other such constraints, the Nurburgring only requires your car to be road legal. You don’t even have to wear a helmet (although it is advisable). I would advise that you do adopt a track day style regime. Ensure you have no leaking fluids, your car is serviced and in good mechanical shape. The ‘ring is long, and you could be doing several hard miles on track, so check your tyres and brakes have plenty of wear left. Spare brake pads are essential. Driving on German roads have all sorts of other requirements such as spare bulb packs, high-vis vests and headlight beam deflectors for driving on the left hand side of the road. I would strongly suggest reading more information on the official Nurburgring Website (nuerburgring.de) and on Ben Lovejoy’s excellent site for UK visitors to the ‘ring, nurburgring.org.uk. There you will find the latest information including on opening times, insurance and ticket prices and suggestions on accommodation. If you decide not to bring your own car, you can also hire many track prepared machines (or at the very least track day favourite models) from some of the rental companies in close vicinity to the ‘ring. These can be quite expensive but may include the likes of third party insurance that might cover you for damage to other cars and to the circuit itself. Be sure to read the small print as some hire agreements cover fuel and laps and some are purely based on your mileage. Some of the more popular providers are: rent4ring , RSR Nurburg and Rent Race Car. 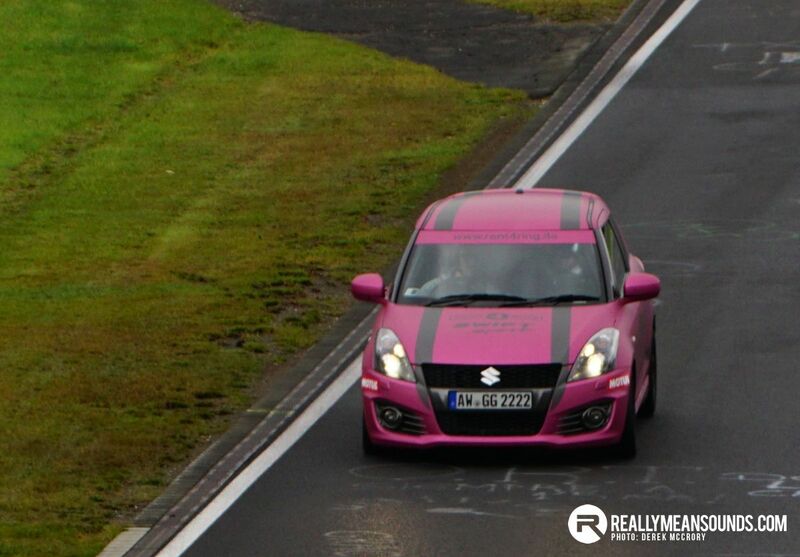 Surprisingly, one of the most fun way to spend a few Euros was Rent4Ring’s 130bhp track prepared Suzuki Swift Sport! Just in case you are thinking of winging it in an Avis rental, don’t. Be sure that most companies aren’t overly keen on Joe Average belting round the ring in a holiday special. They do keep an eye out; Nurburgring trips feature in the small print and you don’t want bag big bills for cooking the tyres on a weazy Panda. Why would the driver have to prepare? 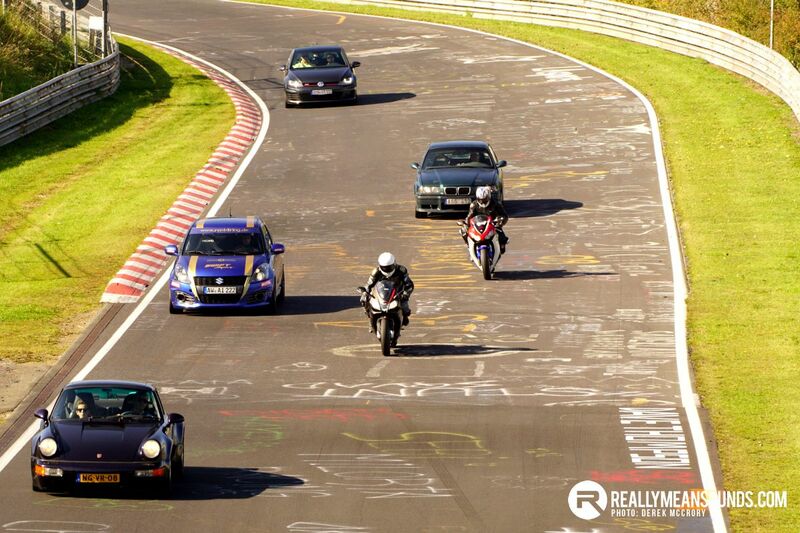 Some people who go to the Nurburgring have no track day experience. I have over a decade of track experience and still found my first outing a daunting prospect. What I did do was speak to others who had been before, and joined a group of RMS members who had been travelling several times. The information they gave me was invaluable in how to build my confidence up and get the most out of the ‘ring experience. There are also thousands of YouTube videos and online guides, not to mention console games that will start to give you the flavour of the place. The ‘ring is only open for tourist days on certain dates and times. Best thing is to check the opening times on the Nordschleife website and ensure your trip coincides with plenty of open track time. When the circuit is busy there can be several accidents reducing your track time (hopefully you’re not involved in them) or just something as inconvenient as fog or rain, so you want to ensure you have options to come back later or the next morning when things are more … enjoyable. On this, pricing for laps or packs of laps (normally sold singly, in packs of 4, 9 and 25) are available at the kiosk at the entrance to the track. At time of writing a lap was €27. 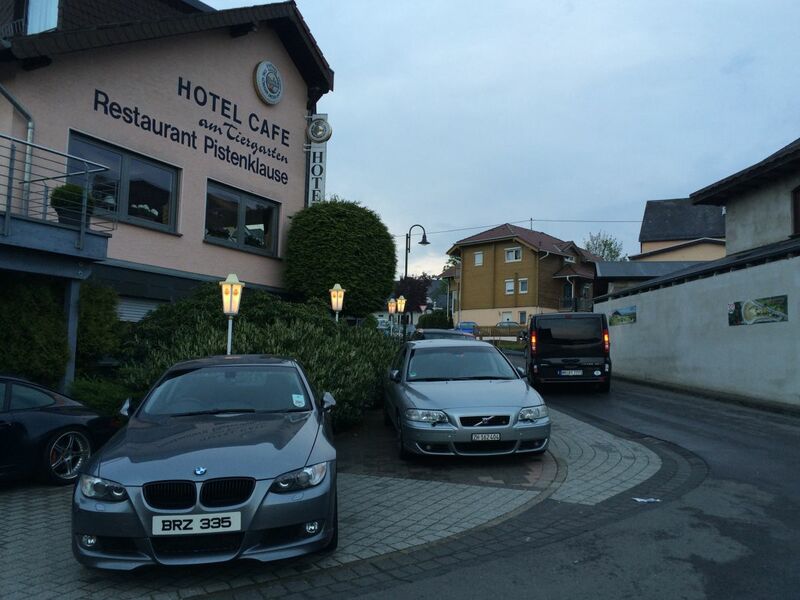 There are plenty of great places to stay near the circuit. Check out the comparison sites such as Booking.com and Hotels.com. Some of our favourites include the Hotel am Tiergarten (in Nurburg and owned by the Schmitz family) and Rennhotel (opposite the start/finish straight). The Pistenklause is the legendary haunt of most drivers during their trip. Book a table in advance and enjoy the famous steak on a stone, whilst browsing the photos taken by one of the photographers on a big screen. Available on iOS, android and on the Nurburgring Website are a selection of webcams at the gates, petrol station, GP track and such. Very handy when the circuit has closed and you can see when it has re-opened and if there are any queues at the petrol station. Dale Lomas’ blog, bridgetogantry.com covers all things Touristenfharten related and is well worth following his Facebook or Twitter feeds to find out the latest on any accidents, cars worth spotting and generally very useful, to-the-minute circuit news. European recovery is always a good option with the likes of the RAC, the AA and maybe even your own insurer covering bringing your car home for you or even just a simple roadside fix. One trip had a Focus ST coil pack fail, and Bongard recovery (who also recover cars which crashes in the ‘ring) took it to their compound and got everything sorted on behalf of the AA. I personally needed a set of rear brake pads on one trip. As I had none, I called a number in the toilets. Not what you are thinking – it was actually the local motor factors and I was even able to use his garage and tools (for a small fee). 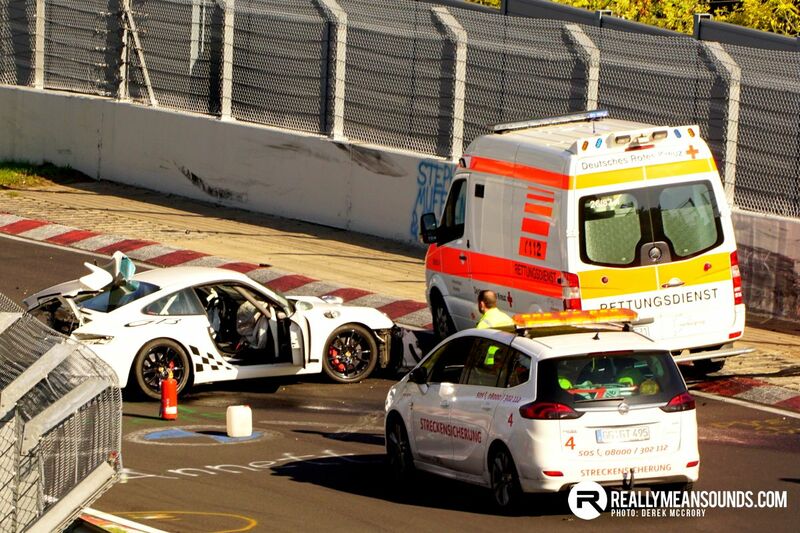 Yes there can be much more serious problems at the ‘ring, and sometimes the rumours and online articles would put you right off any trip there. Thankfully I have little useful experience in an accident at the circuit, but here’s a word of caution on Ben Lovejoy’s site of how serious things can be. Unfortunately there are no direct flights from Belfast to airports nearest the ‘Ring (Cologne and Frankfurt). Aer Lingus, Lufthansa and SAS fly from Dublin to Frankfurt and the likes of Kayak and Skyscanner could help get the best deal. You can’t just take your airport rental onto the ring; see the above section on ring rentals. For more information and pricing on this route see irishferries.com. With the great road links from Belfast to Dublin and the port tunnel dramatically shortening journey times, this may be a slightly better option. Both Stena and Irish Ferries operate out of Dublin Port, and when you get near to Dover you have several options including the Channel Tunnel. See irishferries.com and stenaline.co.uk for fares. As above except you save the 100 miles to Dublin, and do an extra 100 miles over the Holyhead trip. Not so much swings and roundabouts though as the Irish Sea crossing is only 2hrs from the North if you take P&O and so I would expect you to save at least an hour over the Dublin trip. Unless that is, you live in Dublin! Bonus: the vehicle deck is normally full of cars heading for the ring, like an impromptu car show on sea. Why is this our favoured option? It has the least amount of driving time and miles from Belfast. You can leave the port of Larne at 10.30am and the next day be at the ‘ring by lunchtime. It also means going home, if you stay at the circuit until 3pm, you can still be home by early evening the next day. 12.30pm: Depart Cairnryan on the famed A75 towards Carlisle. 8.30pm: Depart Hull Port on P&O crossing, with dinner and overnight cabin on board. At this point your passengers may take advantage of the bar, be warned. Thursday 8.30am: Arrive in Rotterdam (+1hr time zone), and make the 3.5hr, 200 mile haul to the ‘Ring. An hour of which is on de-restricted Autobahn. 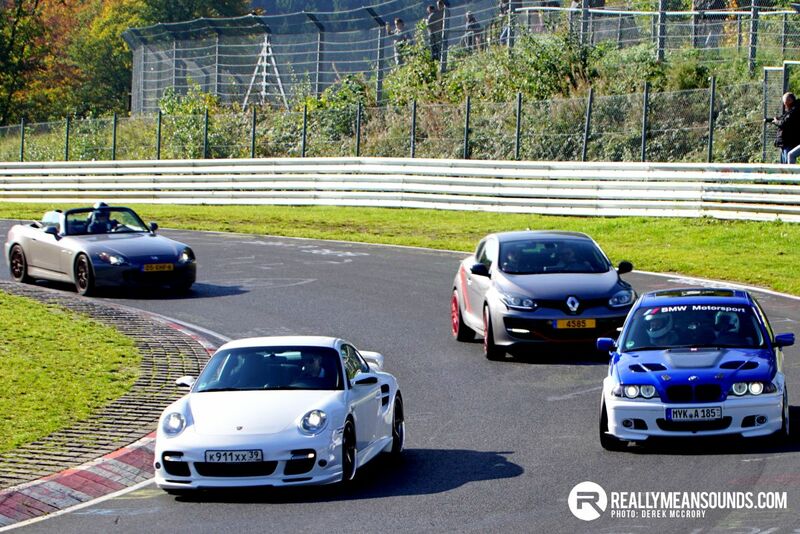 1pm: You pull into the car park at the Nurburgring and immediately buy some laps. I’m sure there is much more to cover and please ask questions in the comments, and I hope I’ve conveyed how straight forward it is to get to the ‘ring and how much fun it can be. Get it booked! Nice one Chief - Thought you'd forgotten about this. Great writeup, and a must-read for anyone who's never been (Neverßeen? :P ) but is thinking of going. You should probably add a caveat that one trip to the 'ring will more than likely result in a wallet-emptying habit of a life time: You're planning the the logistics for next trip on the ferry home from the last. You check out the track side CCTV camera footage at 11:28pm on a Thursday evening 'just to see what's happening.....' You've watched all the TF highlight videos on YouTube at least once and subscribe to them all. The car no longer gets OEM spec stuff come service time. Now that it's a 'ring veteran it gets upgraded tarty bits... like drilled and grooved brakes. The only way to cook a steak is on a stone. No other method is manly enough. You consider Bridge to Gantry time to be a useful and relateable measuring system. Cars driving about with 'ring stickers on from eBay that probably have "never been" get a bit of a slagging. When you're checking out used cars in the classifieds one major item of consideration is it's 'ring lapping ability. | You should probably add a caveat that one trip to the 'ring will more than likely result in a wallet-emptying habit of a life time: You're planning the the logistics for next trip on the ferry home from the last. You check out the track side CCTV camera footage at 11:28pm on a Thursday evening 'just to see what's happening.....' You've watched all the TF highlight videos on YouTube at least once and subscribe to them all. The car no longer gets OEM spec stuff come service time. Now that it's a 'ring veteran it gets upgraded tarty bits... like drilled and grooved brakes. The only way to cook a steak is on a stone. No other method is manly enough. You consider Bridge to Gantry time to be a useful and relateable measuring system. Cars driving about with 'ring stickers on from eBay that probably have "never been" get a bit of a slagging. When you're checking out used cars in the classifieds one major item of consideration is it's 'ring lapping ability. Fantastic. Spoken like a true addict. LOL!! "My most memorable experience was passing a coach full of octogenarians before being ripped a new one by a pursuing Ariel Atom." Brilliant read! I really must start saving to get over there sometime, even if it is in 16 years when the twins are leaving home lol! | Brilliant read! I really must start saving to get over there sometime, even if it is in 16 years when the twins are leaving home lol! Sell the twins you wuss!